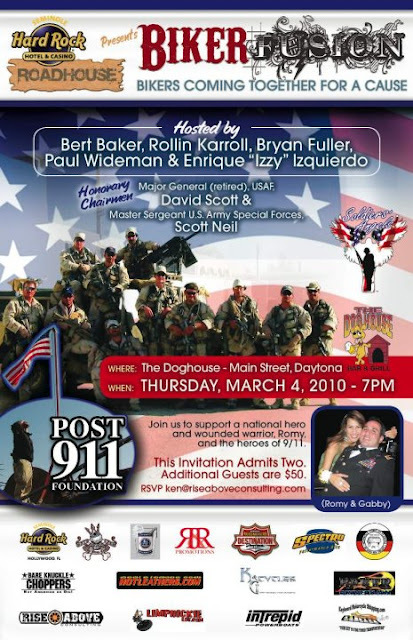 In the fall of 2008, Romulo “Romy” Camargo, a career Special Forces Army warrant officer, was on his third combat tour in Afghanistan when his Special Forces Detachment was ambushed. Romy was shot in the neck but miraculously survived thanks to the Green Beret medics who were able to save his life. 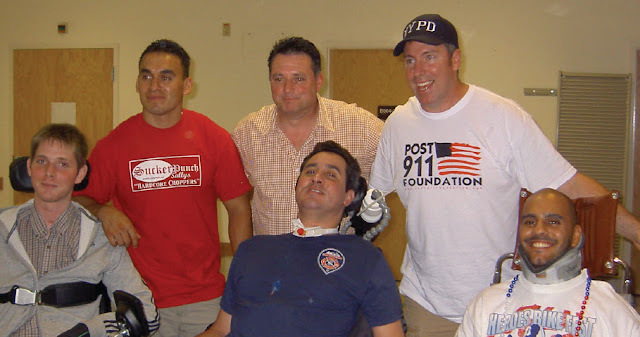 He was evacuated to medical facilities in Germany and then on to Walter Reed Hospital in Washington, D.C.
Romy Camargo (center in picture) is paralyzed from his shoulders down. After a year in the VA hospital he is recovering some of the personal freedom we all too often take for granted -- like breathing without the assistance of a machine. He is now maneuvering his wheelchair by pushing a joystick with his mouth, and moving back home to be with his family. One major hurdle remains – getting back on his motorcycle. Izzy Izquierdo, Romy’s long time friend and Special Forces teammate, is building a bike/sidecar combination at his shop near Fort Bragg, North Carolina. The goal is to get the project finished in time to roll Romy into a celebration party at the Dog House Saloon in Daytona on March 4th. To pay for construction military personnel, policemen, and firemen are joining forces to sponsor a series of Tampa Bay area fund raisers in January, February, and March. “Rollin with Romy Poker Run” on Jan 23rd. begins and ends at Lebowski Barber Shop on Channelside Drive in Tampa. Kickstands up at noon. A $10 donation covers the poker run, entertainment, and food. Following the ride relax in the “man cave”, hang out with Bubba the Love Sponge, listen to rock and roll, get a massage, get your bike detailed, buy a cigar, play Texas hold ‘em with the gang from Stogie Castillos, enjoy the Coyote Ugly dancers live on stage, and get a haircut. The beautiful girls from Lebowski will donate $10 from every cut toward Romy’s bike.